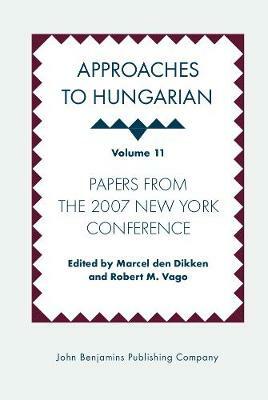 This volume brings together ten papers, all presented at the 8th International Conference on the Structure of Hungarian (New York City, 2007), addressing a wide range of topics in the morphology, phonetics, phonology, pragmatics, semantics, and syntax of Hungarian, with discussion of related facts in other languages as well. The volume includes an analysis of the morphophonology of the infinitival suffix in Optimality Theory, a plea for a phonetically-grounded theory of phonology based on partial neutralization of the v/f contrast, a Government Phonology account of vowel/zero alternations, a discussion of the recursive nature of speech prosody, a context-structure perspective on the pragmatics of polarity particles, a novel outlook on the prosody, semantics, and syntax of negative quantifiers, a structural approach to the difference between factive and non-factive complements and the distribution of the clausal expletive azt, a pioneering study of the licensing and position of overt nominative subjects of infinitival complement clauses, a lexicalist perspective on the distribution of ablative cause-PPs in anti-causative constructions, and an analysis of the complicated morphosyntax of adpositional preverbs and their doubling in terms of partial chain reduction in a phase-based cyclic mapping of syntax to phonology. The volume will be of interest not just to scholars working on Hungarian, but to a general audience of generative linguists.